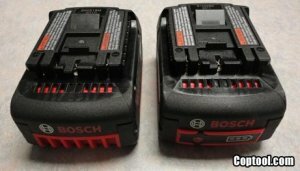 Jay over at Cop Tool put together a pretty simple and probably pretty accurate test, pitting the Bosch 2.6Ah batteries (BAT618) against the new Bosch 3.0Ah batteries (BAT619G). Now why did Bosch and the other manufacturers take years to start using 3.0Ah batteries, when Makita has been using them since they first introduced the world to Lithium-ion tools all those years ago? Well, I don't have an answer to this. Whatever the reason, Bosch now has batteries with a rating of 3.0Ah, and have also packed in a few other features. The new High Capacity or HC (as Bosch calls them) battery packs have also been engineered to work in super cold working conditions. One of the complaints of lithium-ion battery packs over the years, is that they do now work in cold temps, thus leaving workers in cold weather states with poor performing tools. In some cases the tools would not work at all. Bosch's HC battery packs have a low temp rating of 20 degrees Fahrenheit, which should solve most of those cold weather issues. Another nice feature of the HC batteries is the built in fuel gauge. Now this is a feature that might only get used a fraction of the time, but it will save you time throughout their life. Now first thing in the morning you can check your battery status, and start with the battery with the most juice, and put the other on the charger. To see how these two batteries battle it out, you will have to head on over to Cop Tool to see the final results. *Hint* The new HC batteries last longer.